The premise under which Dornbracht invited the architects Neri&Hu (Shanghai) and Rafael de Cárdenas (New York) to develop an architectural environment for the new Vaia series of fittings. The designs produced combine traditional and contemporary elements in a new and progressive way: individual interpretations of the transitional style interior design trend, which was also the inspiration for Vaia and its soft, balanced design language. Supplementary material collages were also developed in collaboration with Mike Meiré, Brand Director at Dornbracht. In conjunction with the architects’ designs, they formed the basis of the real bathroom architectures developed by Meiré und Meiré, photographs of which put the spotlight on Vaia. The architectural designs of Rafael de Cárdenas are based on an unusual spatial form. Chapel-like alcoves emerge from the curving S-shape of the layout and give the structure an almost sacred feel. This leitmotif is logically continued in the door arches connecting the different zones. Traditional elegance and new ideas mingle extravagantly in de Cárdenas' architectural concept. The transparent dome keeps the architecture literally open to the recurring cycle of day and night and produces a constantly changing pattern of light. The material collage "From past to present", inspired by the architectural designs of Rafael de Cárdenas. Brick, Corian, smoked glass and moss, bog oak, marble, cognac-coloured leather and a violet carpet combine to create an exciting background for the fitting’s new dark platinum matt finish. Material collage "Healing effects”, inspired by the architectural designs of Neri&Hu: Vaia in platinum matt is set in natural light in front of marble and concrete, brass and wood. The traditional Asian influences are as perceptible here as the desire to create something new: a balance that seems progressive, yet also healing. 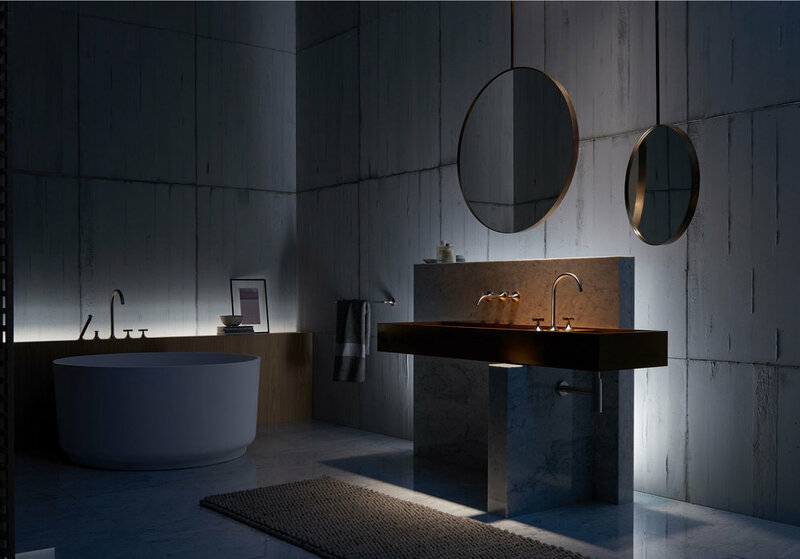 Design sketch from Neri&Hu: Lyndon Neri and Rossana Hu construe the transitional style in the original sense of the word and design the bathroom as a transitional area, as somewhere to linger temporarily and a place of regeneration. “We imagined a fictional place, a house where two characters are living: an introvert and an extrovert”, says Lyndon Neri. Neri&Hu’s architectural concept focuses on the atrium. As the connection between the areas and between the exterior and the interior, it reflects the psychology underpinning our actions in the bathroom. “For us in Asia, water also stands for a great deal of emotional and physical healing”, explains Lyndon Neri. “Bathing and cleansing become an emotional journey to a deeper connection to the inner self and also to the outside world.” The openness of the architecture allows the materials used to interact with the environment. 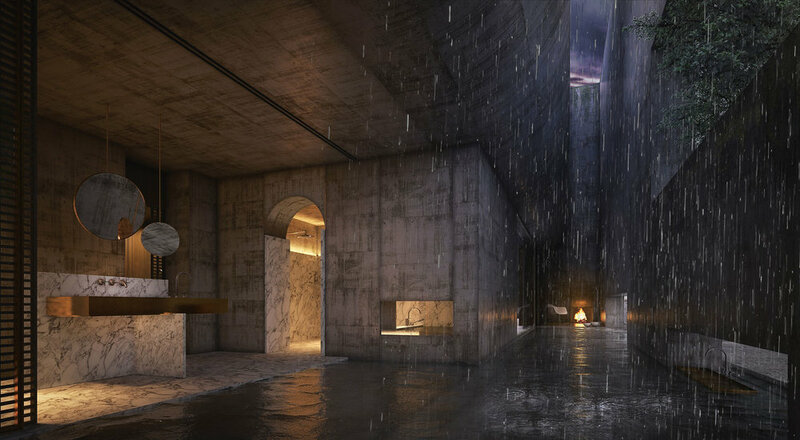 The concrete, the stone, the metals – even the water that Neri&Hu regard as a “building material” – are constantly changing, according to the lighting conditions and the season. Based on the conceptual approaches of Neri&Hu, Vaia in platinum matt is situated as a central and communicational meeting place within the bathroom architecture. Two fittings – one wall-mounted and one free-standing – are positioned there like partners in a dialogue. The transitional nature of the bathroom architecture, the interplay between the exterior and the interior, is emphasized by the use of contrasting forms and materials. Marble meets concrete, bronze and gold contrast with the wood.